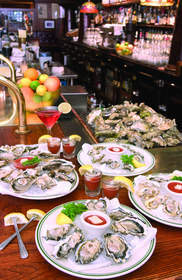 AUSTIN, TX -- (MARKET WIRE) -- October 20, 2005 -- McCormick & Schmick's Seafood Restaurants, Inc. (NASDAQ: MSSR), celebrates National Seafood Month in its three Texas stores. Patrons in the Austin, Dallas and Houston restaurants are learning more about oysters and their health benefits through the in-store "oysterology" program. The program is part of a mission to help consumers understand more about seafood and its nutritional value. With the largest variety of cold water oysters, McCormick & Schmick's "oysterology" program is an on-site learning program that gives patrons insight to oyster truths, myths, tips and facts. Below are some interesting facts about oysters. Greeks were the first to cultivate oysters as early as the fourth century. male, turning female as they age. material and over time produces a pearl. McCormick & Schmick's is also promoting the health benefits of seafood, such as oysters and halibut during National Seafood Month. As the cold and flu season approaches and the rapid spread of avian influenza, or 'bird flu,' becomes more prominent, seafood is a high-source of nutrients to strengthen the immune system. Seafood can also help prevent cardiovascular disease. Halibut, prime during October, and oysters contain high sources of B12, B6, potassium and Omega-3 fatty acids. According to the American Heart Association, Omega-3 fatty acids decrease the risk of heart arrhythmias, triglyceride levels and the growth rate of atherosclerotic plaque. In addition, a new study recently posted online from the Archives of Neurology, one of the JAMA/Archives journals, states consuming fish at least once a week was associated with a 10 percent per year slower rate of cognitive decline in elderly people. McCormick & Schmick's Seafood Restaurants guarantee the freshest selection of oysters and seafood flown in daily from around the world. About McCormick & Schmick's Seafood Restaurants, Inc.
McCormick & Schmick's Seafood Restaurants, Inc. is a leading national seafood restaurant operator in the affordable upscale dining segment. Over the past 33 years, it has successfully grown to 57 restaurants in 24 states by focusing on serving a broad selection of fresh seafood. McCormick & Schmick's inviting atmosphere and high quality, diverse menu offering and compelling price-value proposition appeals to a diverse base of casual diners, families, travelers and the business community. For more information on McCormick & Schmick's, please visit www.McCormickandSchmicks.com. McCormick & Schmick's Seafood <br>Restaurants celebrates National <br>Seafood Month in its three Texas <br>stores. With the largest variety of cold <br>water oysters, McCormick & Schmick's<br> "oysterology program" educates<br> patrons on oyster truths, myths, tips, <br>facts and their nutritional value.